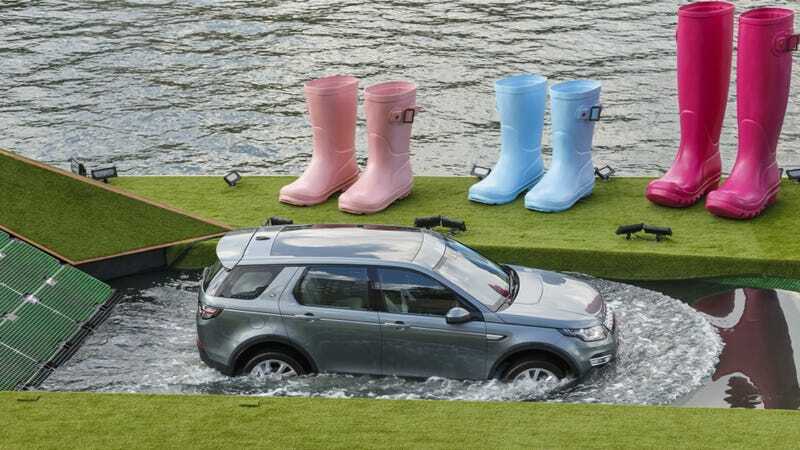 For its Paris Auto Show debut, the 2015 Land Rover Discovery Sport popped out of a trap door, forded a water hazard, and drove by some humorously oversized boots all on a giant barge wrapped in astro-turf. Suddenly I really want to go mini-golfing. After a pair of the SUVs finished parade laps, attractive and apparently famous person Rosie Huntington-Whiteley emerged to give buyers an idea of what a supermodel might look like next to the vehicle. This is complex marking, folks. Try to keep up. Land Rover, which is well aware of how heavily it trades on the extravagance associated with its brand name, has successfully delivered a pretty awesome spectacle on the River Seine. I just wish somebody pulled some putters out of the trunk. The new Discovery Sport goes on sale at the beginning of next year. Land Rover's Design Director and Chief Creative Officer Gerry McGovern says they've already "had 1,000 orders placed before anyone had seen the car" so the company is optimistic about the vehicle's performance. Don't forget Land Rover is a small-batch retailer; the whole brand only sells something like 25,000 SUVs a month so 1,000 pre-orders isn't small potatoes.